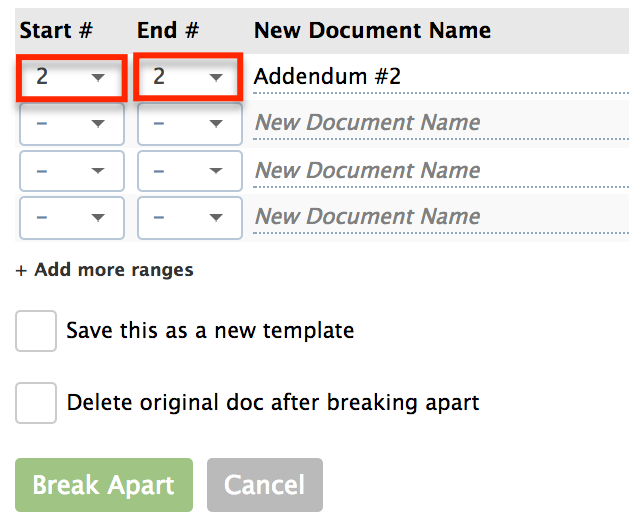 Paperless Pipeline's break apart feature allows you to break apart multiple docs that were scanned together during a single scan. Breaking them apart after they're in the system saves time from having to scan them in separately. Short version: 1) Go to the doc and click the gear then [Break Apart]. 2) Specify the page ranges for the break. 3) Confirm or update the permission categories. 4) Click [Break Apart]. Go to the doc and click the gear then [Break Apart]. You can preview the doc directly on the page to remind yourself where you’d like the page-breaks to occur. Specify the page ranges for the break. In our example document here, we specified pages 1 through 2 as “addendum 1” and pages 2 through 4 as our “addendum 2”. Confirm or update the permission categories. The permission categories will default to the permission categories of the original doc, but you can change them if needed. If you anticipate re-using these same page ranges to break apart more documents in the future, check [Save This as a New Template] to be able to reuse the configuration later. This can be especially helpful for large break apart jobs. 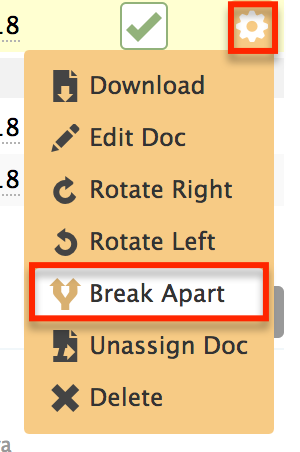 Check whether you’d like to delete the original document after break apart, then click [Break Apart]. 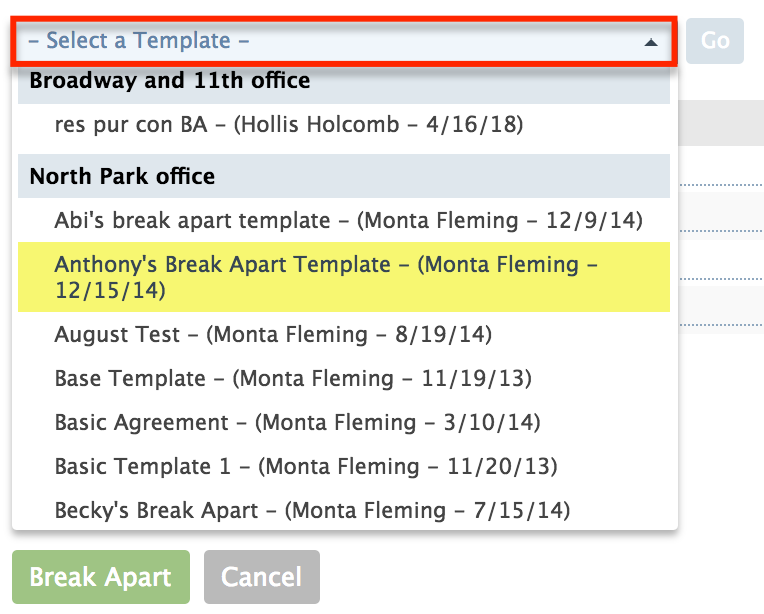 Pipeline will break apart your document into the segments you specified. Users with the "Assign docs to transactions" permission can split any PDF document they assigned to a transaction as long as the doc has not been marked as reviewed. Specify the page range for the break. Specify the start and end pages to extract. In this example, we are extracting a single page (page 2) from the doc by selecting page 2 as both the starting and ending page. Do not delete the original doc. Leave [Delete original doc after breaking apart] unchecked to allow the original doc to remain in tact. From the new doc, click the [Gear] then [Break Apart]. Select the template you saved in the past then click [Go]. The template will be populated with the saved specifications. You can further customize the specifications to fit this particular break apart. Once you’re comfortable with the specifications, click [Break Apart]. Pipeline will break apart your document into the segments specified.